New Zealand was 7 weeks of high adrenalin action spread over both islands. The scenery is superb, but the weather was a bit dodgy for much of the trip even though it was summer. We flew into Auckland and stayed for a while with friends before heading up to Paihia in the north for some kayaking and sailing. We gradually moved down the north island taking in Rotorua, Taupo and Wellington before crossing the Cook Straits to the South Island where we kayaked in Picton and Nelson before heading down to Franz Josef for some glacier walking. A stunning railway crosses the island from Greymouth to Christchurch which includes 4 high viaducts. After Christchurch we went to Kaikoura which is one of the best places in the world to see seabirds and whales. 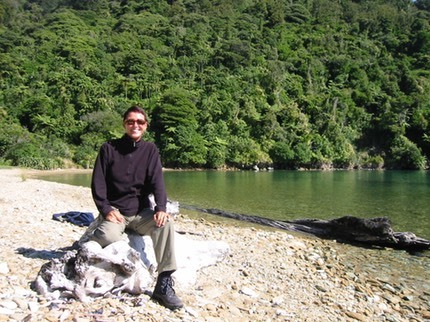 We completed NZ with Jonna's birthday in Picton after walking the Queen Charlotte Trail. 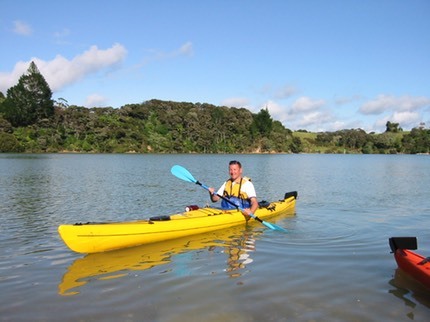 This is me in action in the bays around Paihia on our 2 day trip which involved camping out overnight. We were guided on the first day and toured around for about 20k. On the second day we were unguided and headed over to Russell where a pub holds New Zealand's alcohol licence number 1. 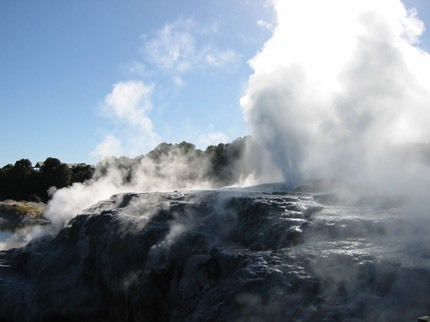 Rotorua is famed for its volcanic activity and we saw plenty of geyser action. Additionally the whole town stinks of sulphur. Whilst here we did our obligatory parachute jumps from 12,000ft. Awesome and the best hangover cure you can imagine. I rather foolishly signed up for a tandem kayak run down the Kaikoura river. It involved 11 rapid runs including this 7m monster with an Olympic standard guy behind me doing the steering. It was a very scary ride and not one I would do again!!!. The kayak becomes completely submerged at the foot of this fall and seems to take an age to emerge. 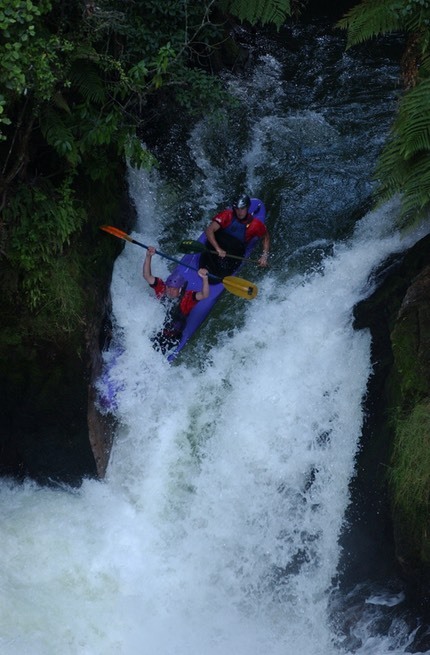 We followed this up a few days later with a more serene white water raft trip on the Tongariro. On the South Island we signed up for a couple of 3 day kayak trips. The first was in the Marlborough Sounds and was just us in a canoe. 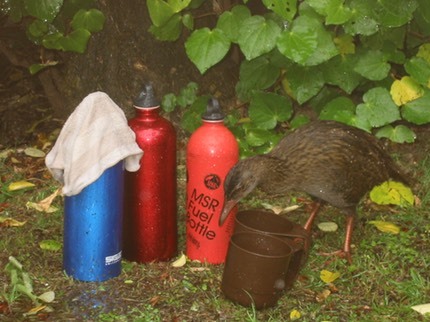 We explored for 3 days, camping out and being visited by the strange Weka bird which was quite adept at cleaning pots and pans for us. It also stole a fork. The weather was foul and the trip back was undertaken in a 4-ft swell which sorely tested our skills, but we made it. 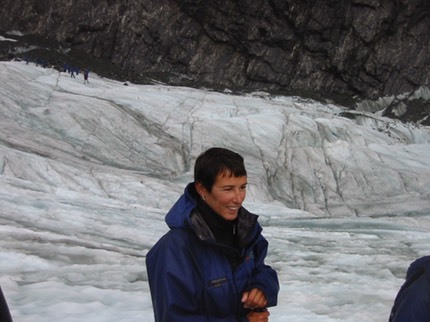 Down the west coast of the South Island we visited Franz Josef where a glacier comes down to almost sea level and can be climbed. It was freezing cold and rained for most of the trip. We had crampons and 4 layers of thermal clothing. We had hoped to do a snow landing helicopter trip but this was postponed for 3 days in a row and we had to leave. Superb bird watching offshore where a deep canyon brings Antarctic water near to shore. 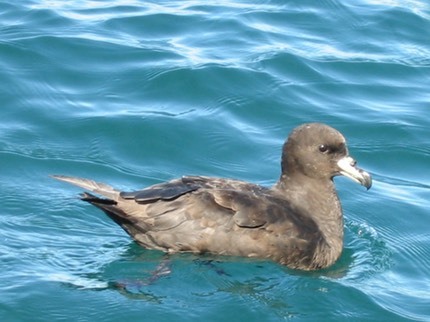 This is a petrel and we also saw 7 species of albatross. The day after this we swam with sea lions in 5mm full wetsuits and still froze. Jonna's fortieth birthday and we celebrated with a tramp along the Queen Charlotte trail. It's a neat setup where a water taxi takes you to the beginning and then picks you up hours later at a pub further along the track. How cool is that?. It's also the Post boat.